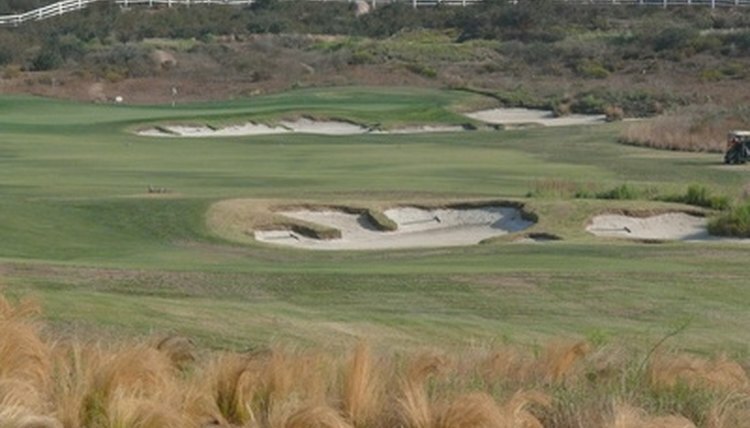 Of the five major components on a golf course, sand and water are least friendy. Golf has many variables that affect play, including the temperature, precipitation and even how recently the grass has been mowed. But the parts of the golf course remain constant. Every hole on a golf course has five major components. New golfers should understand these components to help them guide their club selection and plan their shots. The tee box, or teeing ground, marks the place where the hole begins. This area has a flat surface to allow golfers a clean tee shot. Most golf courses have more than one set of tee boxes on each hole, marking the beginning point for golfers of varying ability levels. The golfer should tee his ball between two markers located at each tee box. You can place your tee and ball up to two club lengths behind the markers, but not in front of them. Each fairway measures approximately 30 to 50 yards across and stretches between the tee box and the green. The closely mowed grass makes hitting the ball from the fairway easier than from other areas of the course, so the goal generally is to place the ball in the fairway with your tee shot. The green holds the hole. The grass on the green is cut short to allow the ball to roll easily when a golfer is putting. The green has slightly longer grass on its edges, generally referred to as the fringe. Golfers must learn to "read" the green, because the condition of the grass and the contour of the green impacts how the ball will roll toward the hole. For example, if the green is firm and dry, the ball rolls quickly, but on a wet green the ball rolls slower. The rough lines the fairways. It has longer grass than the fairway or green, creating an area from which it is more difficult to hit a ball. Some courses keep the grass at different lengths in different areas of the rough to make play more unpredictable and challenging. Hazards make play more difficult. Golf courses have two types of hazards: bunkers and water. Bunkers are holes in the ground filled with sand that typically line the fairway or surround the putting green. Water hazards include lakes, ponds, rivers, creeks and even the ocean at coastal courses. When a water hazard sits between the tee box and green, it has yellow stakes around it. If it lines the perimeter of the hole but does not come between the tee box and the green, it has red stakes.